The Bassingthwaighte family from Wallumbilla in Queensland has achieved a rare trifecta in one of Australia’s most strongly contested commercial cattle competitions, with their Santa Gertrudis winning three major sections of the nation’s richest beef competition of its kind, at Grassdale Feedlot near Dalby this morning. 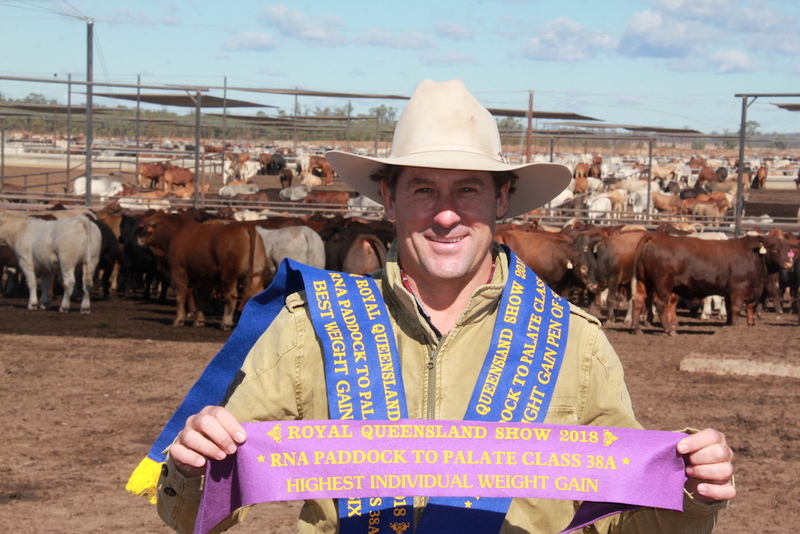 Alastair and Andrew Bassingthwaighte’s entries placed first for 100-day export and 70-day trade cattle in the prestigious RNA Paddock to Palate Competition presented by Mort and Co, recording average daily weightgains of 3.118kg and 3.05kg respectively. The Bassingthwaightes also claimed highest individual weightgain, with one of their Santa steers producing an ADG of 3.33kg/day. Also sharing in the $46,000 prize money offered in the competition was Atkinson Pastoral Co, which produced the highest individual weightgain among 100-day entries for one of its Angus x Droughtmaster steers with an ADG of 3.446kg/day. Meanwhile in the 2017/18 Paddock to Palate Wagyu Challenge, Kuro Kin Wagyu based in Merriwa in New South Wales prodcued the highest weightgain with its pen of six F1 Wagyu x Angus recording an ADG of 1.156kg. Wentworth Cattle Co, Clermont also went home with a ribbon and a ‘steak’ in the $10,000 Wagyu Challenge prize money, with one of its Wagyu F2s producing the highest individual weightgain with an ADG of 1.325kg. RNA beef cattle committee chair Gary Noller said the Paddock to Palate competition was an opportunity for some of the nation’s top beef producers to benchmark their genetics, with more than 1000 head of cattle entered this year. “The cattle are all fed together and processed together, so it takes a lot of the variability out of benchmarking,” he said. “The Bassingthwaighte family have been involved in the Queensland beef industry since the 1950s, so it’s great to see them take home three ribbons – it’s well deserved. Both the Paddock to Palate competition and Wagyu Challenge now move from weightgain to the final phases – carcase quality and MSA meat quality assessment. The Paddock to Palate Competition is three-phased, comprising best aggregate weightgain over 100 days (70 days for trade); a carcase competition and an MSA eating quality competition, while the 2017/18 Wagyu Challenge is four phased comprising best aggregate weightgain over 370 days; a carcase competition; carcase value and finishing in a beef taste-test. The cattle entered in the 2018/19 Wagyu Challenge are currently in the feedlot. The exhibitors who poll the highest aggregate scores in classes for 70-day, 100-day and longfed Wagyu are then awarded the overall prizes at an awards presentation breakfast at the Royal Queensland Show on Friday 10 August. Major sponsors of the Paddock to Palate Competition include Mort & Co, JBS Australia, Zoetis, Elanco Animal Health and Rabobank. 1st – Wentworth Cattle Company – Wagyu F2+ – ADG 1.325 – Clermont QLD.